U3A is an organisation providing activities and opportunities for learning for retired and semi-retired men and women. 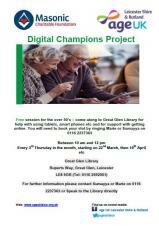 Free drop-in session for the over 50's to learn and get help with using tablets, smart phones and support getting online. For more info contact Sumayya or Marie on 0116 2592901 or speak to the library directly. Monthly Meeting 2pm at Dolly's Tearoom, Church Road. All who want our village to cherish and preserve these interesting and helpful small animals are most welcome. All enquiries to Val 0116 2593206. Great Glen WI on the third Tuesday of every month. Crafts, speakers, visits an friendships, quizzes, darts and skittles. Methodist Church Hall, Oaks Road. Doors open for viewing 2 - 4pm. All are welcome, entry forms and details from The Post Office. Entry forms to be in by 7.30pm Friday 24th August. As a child Andy was always involved in the community activities such as the Church Lads Brigade and often seen riding the Co-op's butchers bike around the village after school delivering groceries to the OAP's. 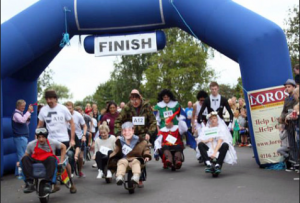 It was over 25 years since the wheelbarrow race had taken place, once one of the carnival week events traditionally the wheelbarrow race was a race around the village stopping at each public house for a pint. Once the word was out that the event was being rekindled Andy had made a rod for his own back promising to deliver, all the red tape was overcome and the rest is now history 2009 was a huge success and 2010 even bigger. The event is now firmly on the village calendar as probably the biggest single event the village now has. It has attracted publicity via Leicester Mercury, Harborough Mail, Countryside La Vie and even ended up on YouTube, see the links below. National Open Garden Scheme, Garden Open for Charity. 1 St Thomas's Road, 1st & 2nd September 12- 5pm.